Kirk Bell May 16, 2018 Comment Now! The day begins in a Sequin Blue 2019 Bentley Continental GT at the exclusive Kitzbuhel Country Club in the Tyrolean region of Austria. Set against verdant rolling hills and tooling through storybook villages, it would be easy to think one is lost in a fairy tale. This car’s cabin is outfitted with two-tone Portland (cream) and Imperial Blue leather upholstery with Liquid Amber wood over Piano Black veneer trim. It’s hand-crafted and beautiful, and the front seats coddle occupants with 20-way adjustments in pod-like alcoves akin to first-class airline seats on overseas flights. It’s useful, too, as Bentley provides rails for storage along the sides of the center console in addition to the console bin and door pockets. The two back-seat positions can be used, even by adults, but that will require intense negotiations with front seat occupants over leg room, and nobody will be happy with the settlement. The trunk is fairly roomy, too, with 12.6 cubic feet of cargo space—about as much as you get in a compact sedan. While this cabin is brilliant, Bentley offers more adventurous trim and upholstery options for its third-generation Continental GT, like the new diamond-in-diamond quilted leather. Each diamond features 712 stitches and the cabin has almost two miles of thread. The new Côtes de Genève trim also holds more visual interest than Piano Black. A 0.6 mm-tick machined-aluminum panel inspired by the mechanical beauty of Swiss watches, Côtes de Genève won't show finger smudges like black, either. The Liquid Amber wood looks wonderful. Each Conti GT has more than 10 square meters of wood, and company craftsmen spend nine hours hand-setting the wooden inlays. Look further to uncover some true surprise-and-delight elements. Available diamond-knurled dials serve as both a tactile treat for the fingers and a link to Bentley's past. By contrast, the modern three-position center display puts on a show as it switches from a wood face to a row of performance dials to a 12.3-inch touchscreen. More than 40 moving parts rotate the screen. That screen, as well as the digital instrument panel display, come by way of Audi thanks to Bentley's Volkswagen Group ownership. The two provide the functionality of today’s best infotainment systems, including such features as Apple CarPlay, Google point-of-interest search, and real-time-traffic information. The digital cluster may be useful, but something is lost by the lack of watch-like instrument dials of Bentleys past. Enough appreciating this beautiful cabin. Time to focus on the drive. 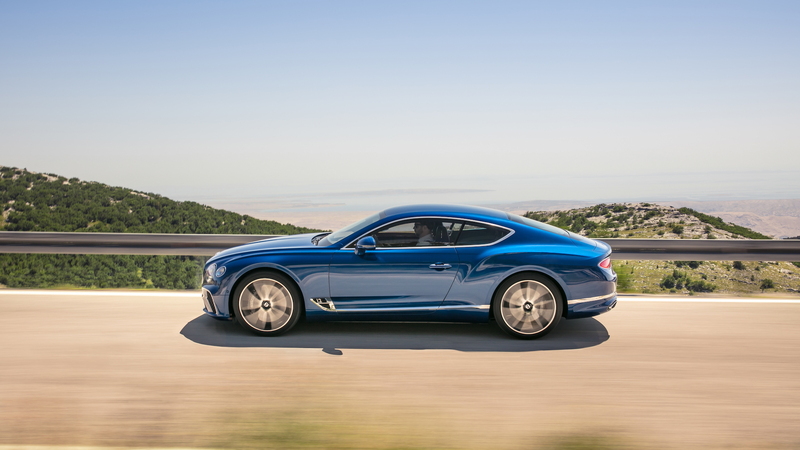 From behind the wheel, the Continental GT imparts a solid, seemingly weighty feel, like it was carved from a single block of steel, or, more appropriately, aluminum. The roads of this Tyrolean tour make for slow going, though, as they link one quaint village to another. Among these rich green hills, baroque chalets, and the occasional gothic church, a slow pace suits the drive. The scenery provides the entertainment. Now is a good time to test the driver assistance systems, which are also likely on loan from Audi. Bentley outfits the car with adaptive cruise control, active lane control, traffic jam assist (a combination of those first two), blind-spot monitors, night vision, and forward-collision warnings. The systems work as advertised. 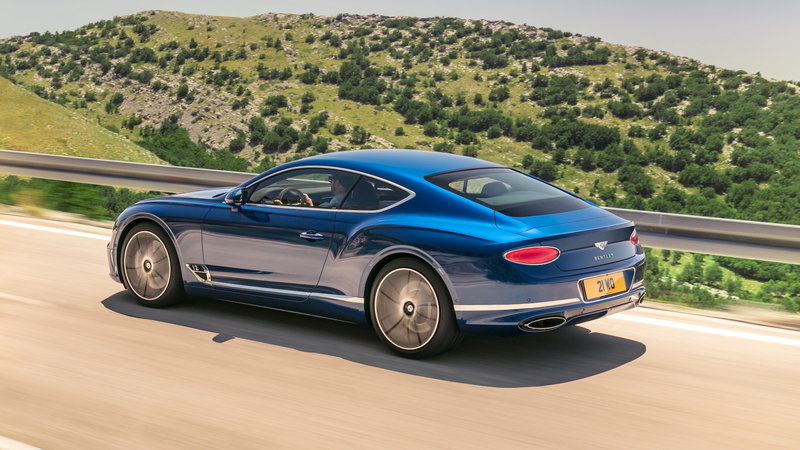 The news is that the Continental GT gets a full spate of safety features, bringing it in line with modern luxury cars. The villages give way as the route takes us to the legendary Glossgockner Pass, at 8,215 feet the highest paved mountain pass in Austria. It just opened about a week ago, and plows had to carve out portions of the road from snow as high as 10 feet or more. At the top of the pass, we take the time to shoot photos of the car against the snowy Alpine vista. The new Continental GT stands out as unmistakably beautiful even in this breathtaking scene. 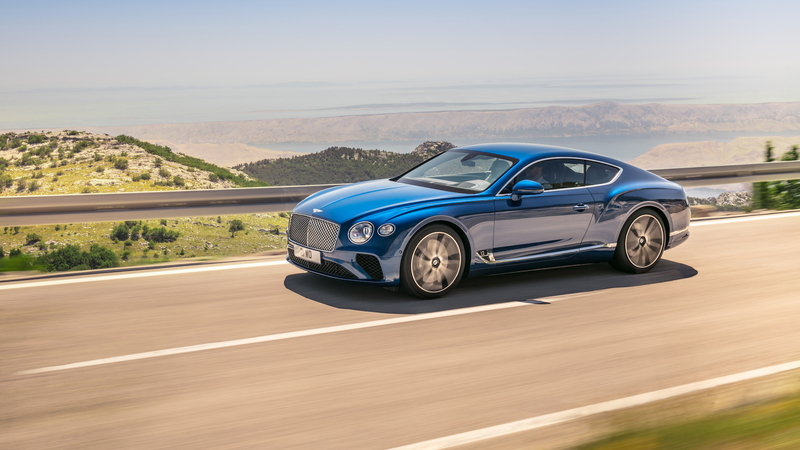 The 2019 Continental GT sports a lusty shape that pays homage to the past while pushing the company’s design aesthetic into the future. Put the car next to its predecessors, and the overall body line, rounded headlights, and in-your-face rear haunches are clear elements shared by all three generations. Zero in on the details, though, and the 2019 sets itself apart. The body panels take on crisper shapes, as shown by those haunches, as well the surfacing on the front fenders and hood. This interplay of sharp edges with smooth, curvaceous surfaces was inspired by aircraft fuselages. The headlights have a cut crystal appearance, while the taillights are simple parabolas on a wide rear end. New chrome hockey stick trim strips along the lower portion of the body replace straight trim and feature “12” symbols in relief at their front edges. The placement of the front axle also stands out; it sits 5.3 inches farther forward, which places an emphasis on the length of the nose and creates a longer “prestige mass” between the center of the front wheel arch and the front of the door line—a clear indication of the rear-drive nature of the platform. Appreciating the scenery, both automotive and natural, is great, but the downslope of the twisty mountain road beckons. Bentley claims it has created the best grand tourer in the world by making the car sportier while maintaining ultra-luxury levels of refinement. Time to test that claim. Flip the Drive Dynamics Control—engineers call it Charisma Control—to Sport mode, and the Continental GT comes alive, despite carrying 4,947 pounds. The variable-ratio electric-assist power steering traces the lines of these twisty Austrian roads like a skilled cartographer, adding weight and quickness in Sport mode. The car responds to steering inputs like an athlete. Enabled by a new 48-volt system, active roll bars do their bloody well best to keep this beautiful beast flat through corners. A three-chamber air suspension at each corner with adjustable dampers ties the car down to the road in Sport mode and creates a smooth, refined ride in Comfort mode, despite low-profile 21-inch wheels. Bentley mode is a good compromise between the two, and the car is both sporty and refined in all modes. A programmable Custom mode lets drivers pick the settings for the engine and transmission, springs and damping, roll bars, steering, and torque distribution. The car's architecture can take some of the credit for its athleticism. It’s the MSB platform that the Conti GT shares with the Porsche Panamera. In its last two generations, the Continental used a steel platform adapted from the VW Phaeton. This time, however, Bentley engineers were embedded with Porsche’s people during development. That allowed them to get the hard points, length, width, and track they wanted. The aluminum-intensive structure and aluminum body panels save 190 pounds, while the car is 167 pounds lighter overall. Balance improves from 58 percent front, 42 percent rear to 55/45 thanks in part to the forward axle position. In fact, the engine has moved so far back that the front driveshaft now runs through the W-12 instead of behind it. It also helps that the W-12 is 28 percent shorter than a typical V-12, which allows it to sit farther back in the chassis than the alternative. These mountain switchbacks challenge the Conti GT due to its weight, though. Enter too hot and it will push forward as the physics of changing directions with two-and-a half-tons can be problematic, active roll bars and better balance or no. Bentley has a solution in the form of massive brakes. The car boasts 15.5-inch front rotors clamped down upon by 10-piston calipers and 15-inch rear rotors with 4-piston pinchers. If that much swept area and 28 pistons won’t do the trick, you are driving irresponsibly. At the bottom of the pass the road signs change from German to Italian. The scenery is still idyllic, but the roads gradually straighten out into highways. It’s a good time to focus on the W-12 under that sensuous hood. New this year from the crank out, the W-12 cuts 66 pounds versus the outgoing version, gets both port and direct injection, adds variable displacement, and features twin-scroll turbos. All that helps it turn up the wick on power while efficiency improves by 16 percent according to European measurements. Horsepower increases from 582 to 626 at 6,000 rpm, while torque jumps from 531 to 664 pound-feet and it’s on tap over a broad range from 1,350 rpm to 4,500 revs, reaching max output in less than a third of the time than its predecessor. Smooth and commanding, the W-12 pushes the Continental GT from 0-60 mph in just 3.6 seconds on its way to a 207 mph top speed. The W-12’s unique configuration—it’s essentially two VW VR6s on the same crankshaft—means it doesn’t sing like a V-12. Instead, it sounds like a refined version of a VW VR6, with the same burps and blats between gears. It’s so much more refined, though, that when the cylinder deactivation effectively shuts down the driver’s side VR6 in light-load conditions, there’s no telling what cylinders are just going along for the ride. The power routes through an 8-speed dual-clutch transmission, a Porsche PDK programmed for greater refinement. It has the urgency of a Porsche gearbox in Sport mode, but it smooths over shifts like a highly trained chauffeur in Comfort mode. From the transmission, the power defaults to the rear wheels and, when needed, some can flow to the front. That's a change from the outgoing model that sent its power in a 40/60 front/rear split. In Comfort or Bentley mode, this version sends up to 38 percent of the torque, or up to 296 lb-ft, to the front. In Sport, only 17 percent, or 59 lb-ft, will be routed up front. That makes this Continental driftable as the 59 lb-ft won’t usually be enough to straighten out oversteer. Feeling cheeky? Drift your Bentley. The tour ends by crossing back into Austria and catching a charter flight to Munich. Breakfast in Austria, lunch in Italy, and dinner in Germany. It’s the kind of life a Bentley owner might live. Would that I were they. 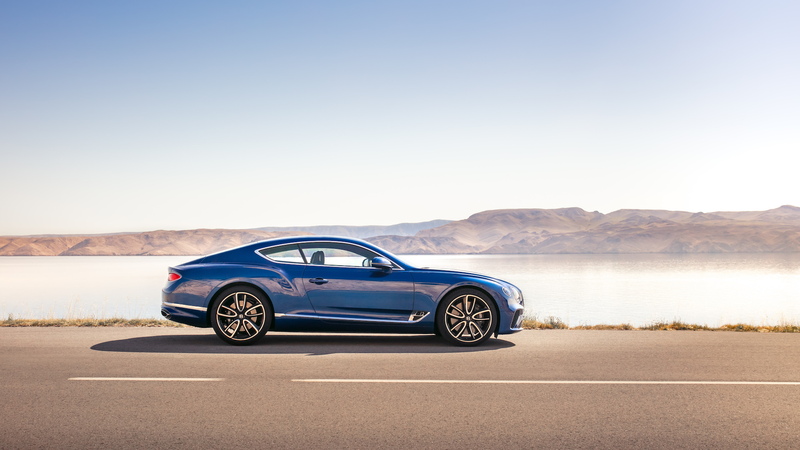 With a little help from Porsche and Audi, the 2019 Continental GT is sportier and more technologically advanced than ever while retaining Bentley’s traditional strengths of sensuous design and handcrafted interior elegance. Is it the finest grand tourer in the world? Aston Martin has a legitimate claim to that throne with its new DB11, but the Conti GT is certainly in the conversation and I'd be happy with either. England is building grand touring cars that qualify as dream machines these days. 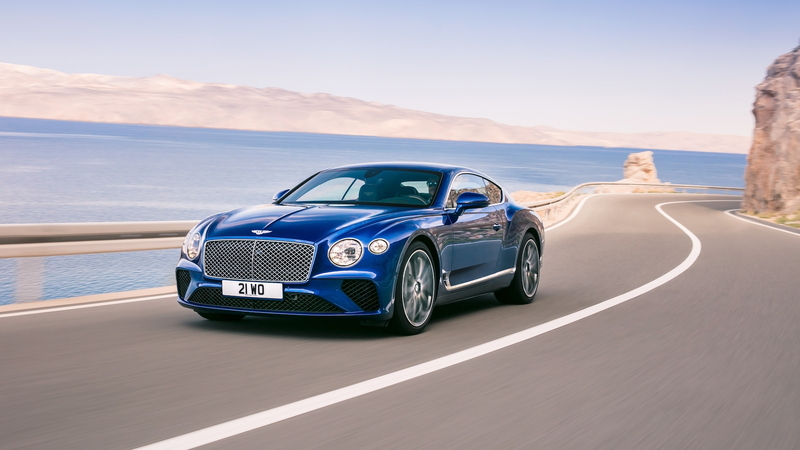 Set for the first deliveries next spring with a starting price of $214,600 in the U.S., the 2019 Bentley Continental GT will live its storybook life in Europe for almost a year before it hits our shores. It’s a shame U.S. buyers won’t be able to experience this type of European grand tour in their cars. Then again, customer who can afford such a beautiful car are likely living fairy tale lives of their own. Bentley provided travel and airfare to Internet Brands Automotive to bring you this firsthand report.